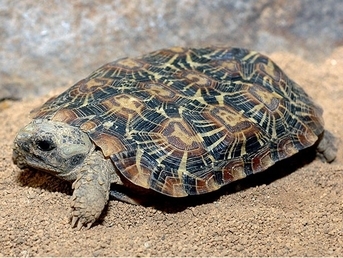 FreshMarine.com - African Pancake Tortoise - Malacochersus tornieria - Buy African Pancake Tortoise Now and Save! The African Pancake Tortoise, whose binomial name is MalacochersusTornieri, is one of the oddest and rarest species of tortoise. The presence of fenestrae in the bones, make the plastron thin and soft, which can be contracted and used to fit into tight spaces, and this fact adds to its uniqueness. It also moves in and out when the animal breathes. It also has a disadvantage as it does not offer any kind of protection as the hard shell does. The carapace can reach up to 18cm in length and is flat and depressed in shape. The typical color pattern on the carapace is pale brown base with dark brown or black scute borders. 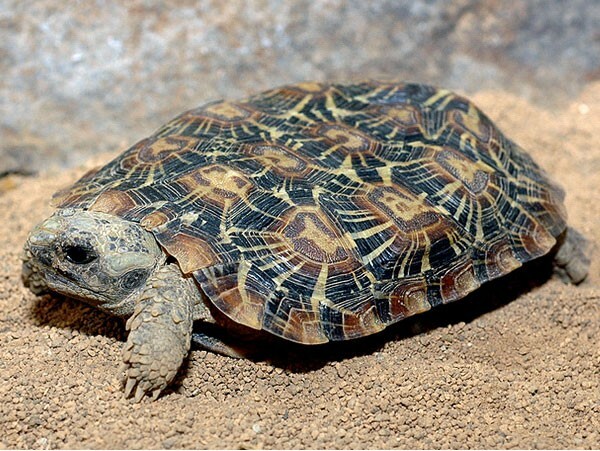 Malacochersus Tornieri is the shortest known tortoise but it is also a fast runner and agile climber species. The females are larger with thicker tails whereas the male counterpart is smaller in size and has thin tail. The African Pancake Tortoise lays only a single egg in a year, in wild and the months of July and August seems most suitable for the process. But in captivity, they lay 2 to 3 eggs in a year and it is done in any month. The newly born babies are not as flat as adults but are just as flexible. Most of Malacochersus Tornieri�s time is spent among the rocks, their shelter. Their mornings are filled with activities like feeding and emerging to bask. They are extremely social and mostly live in a group as long as there is adequate food for all. They can also share the same crevice. Malacochersus Tornieri is native to Tanzania and Kenya. In their natural habitat, they dwell in thorn scrub and savannas with rocky kopjes where they can hide and discover protection. They are very adaptive and if proper care is provided, they can happily live in captivity. They prove to be good food for their predators so they are to be kept indoors in a terrarium. The floors of terrarium can be covered with rabbit pellets. Plastic planters act as good sleeping places. For making the environment more stimulating, large flat rocks can be used. Temperature of the cage should vary from 70 to 80 degree Fahrenheit in winters and 80 to 90 degree Fahrenheit in summers and wide spectrum fluorescent lights should be used to light terrarium. Remember to build hot spots away from the sleeping quarters because this will help them to freely move between cooler and warmer areas according to their requirement. These tortoises are strictly herbivorous and eat a variety of grasses, usually dry, fallen fruits and vegetables. A heavy and light feeding every alternative day keeps them healthy. In captivity they should be provided chopped green leafy vegetables like dandelion, hibiscus leaves and tree mallow. Sprinkling of vitamins to the food, once a month also ensures vigor. Fruits like apple, strawberries should only be provided on rare occasions. Most of the feeding is done in the mornings.